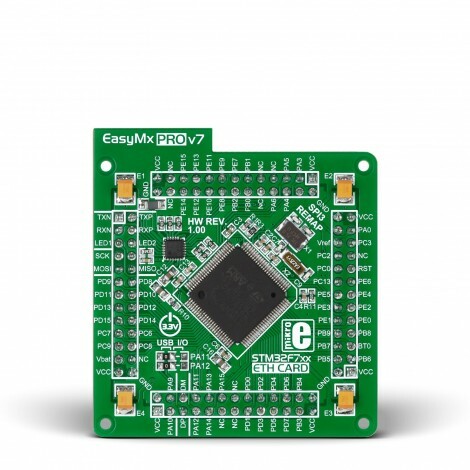 This is the first MCU card for EasyMx PRO v7 to carry an ARM® Cortex®-M7 microcontroller. Specifically, the STM32F746-100 microcontroller with on-chip peripherals. After testing and building the final program, this card can also be taken out of the board socket and used in your final device. 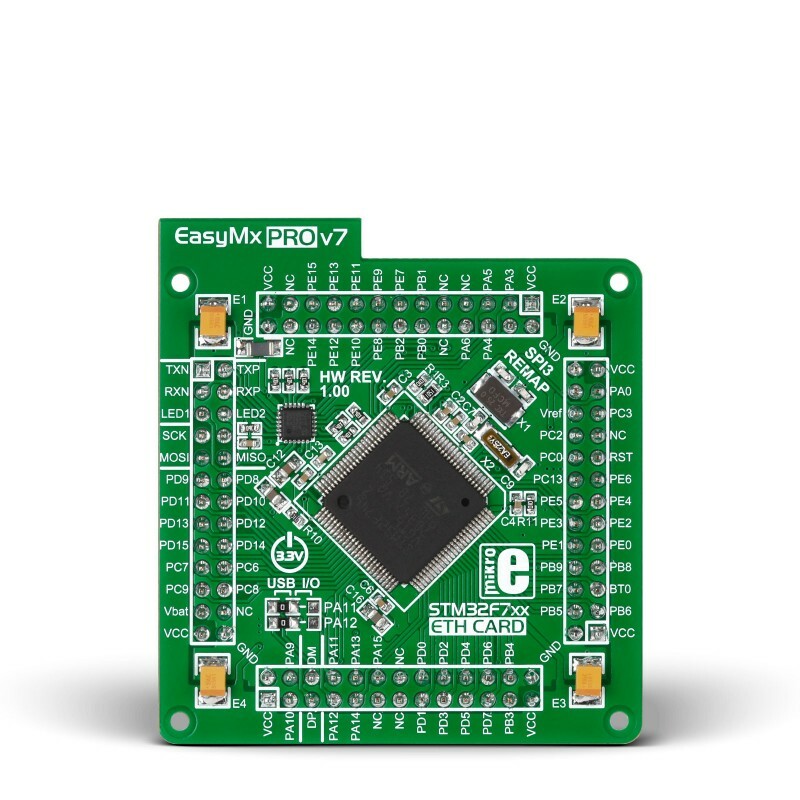 STM32F746 operates at 216 MHz reaching 1082 CoreMark/462 DMIPS which is the maximum theoretical performance of the Cortex-M7 core. The chip has 1 MB of Flash memory and 320 KB of RAM. It also features Ethernet, Quad SPI and more. For lowest power modes, the MCU also includes 4 KB of backup SRAM. Cortex-M7 is backward compatible with the Cortex-M4 instruction set. 25 MHz crystal oscillator. We carefuly chose the most convenient crystal value that provides clock frequency which can be used directly, or with the PLL multipliers to create higher MCU clock value. MCU card also contains 32.768 KHz crystal oscillator which provides external clock for the RTCC module. USB communication lines. These two jumpers, when in USB position, connect D+ and D- lines of the onboard USB connector with PA1 and PA12 MCU pins. Since the MCU supports USB, jumpers are in USB position. Ethernet transceiver. MCU card contains single-chip Ethernet physical (PHY) layer transceiver which provides additional Ethernet functionality to the microcontroller.